Juan Gea (juang3d) awarded D4696: Outliner: Show parenting hierarchy in view layer view a Like token. Juan Gea (juang3d) added a comment to D4696: Outliner: Show parenting hierarchy in view layer view. Juan Gea (juang3d) added a comment to rBb24a255ca678: RNA: error on register when classes use invalid identifiers. Juan Gea (juang3d) added a comment to T62965: Blender 2.80 Close when try weigth paint a simple cube . I've been able to reproduce the problem, but just in Linux, in windows I don't get a crash. Juan Gea (juang3d) awarded T62965: Blender 2.80 Close when try weigth paint a simple cube a Burninate token. Juan Gea (juang3d) added a comment to D4304: Compositor: Added denoising node. This is understandable, but don't you think that you should have warned everyone clearly that this was going to happend? Juan Gea (juang3d) awarded T60094: Render crash when using Python API to modify object data in frame_change_pre handler a The World Burns token. Juan Gea (juang3d) added a comment to T60094: Render crash when using Python API to modify object data in frame_change_pre handler. Just stumbled upon this bug, what a big bug! Juan Gea (juang3d) added a comment to D4459: Cycles: Added fix for bump terminator problem..
Would this affect objects without bump? Because we have those terminator problems also in objects without any bump and maybe this can also soft those problems. Juan Gea (juang3d) awarded D3850: Mantaflow [Part 1]: Added preprocessed Mantaflow source files a Love token. Juan Gea (juang3d) awarded T60695: Optimized per-datablock global undo a Love token. Juan Gea (juang3d) created T61080: Undo not working at all when you disable "Global Undo". Juan Gea (juang3d) added a comment to D4189: TopologyRake for dyntopo.. This is a pretty neat feature for sculpting! Juan Gea (juang3d) awarded D4189: TopologyRake for dyntopo. a Yellow Medal token. Juan Gea (juang3d) awarded D3509: Add support for tiled images and the UDIM naming scheme a Love token. Juan Gea (juang3d) added a comment to T56125: No Vector Displacement On Instances. Sorry, for the tokens thing, something happened to my browser. Juan Gea (juang3d) awarded T56125: No Vector Displacement On Instances a Y So Serious token. I can´t understand why Vector Displacement not working on instances is not a bug. Juan Gea (juang3d) added a comment to T56123: Cycles: Allow variable render tile size for mixed gpu/cpu. Yes, I noticed it too lately, there is not much of a difference, at least not like before. 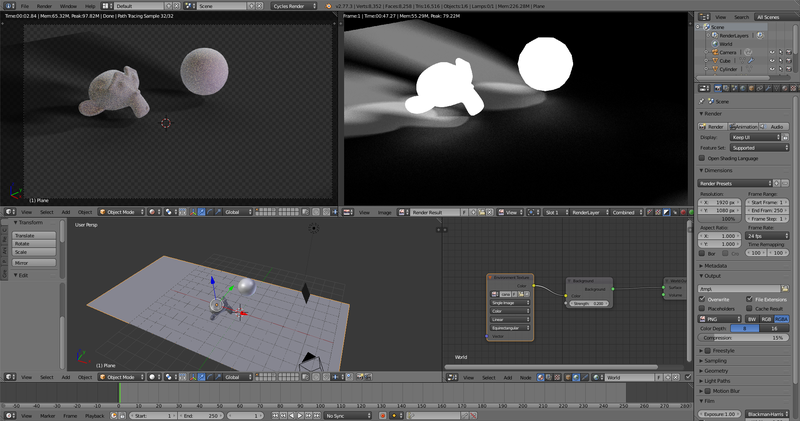 Juan Gea (juang3d) added a comment to T57811: CRASH - Render crashes Blender when you use AO Bounces in certain scenes, not in simple or empty scenes.. Sorry, fixed the file link. 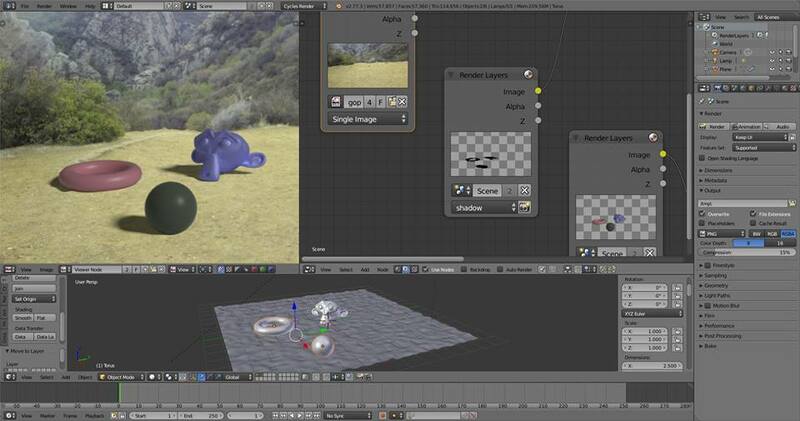 Juan Gea (juang3d) updated the task description for T57811: CRASH - Render crashes Blender when you use AO Bounces in certain scenes, not in simple or empty scenes..
Juan Gea (juang3d) created T57811: CRASH - Render crashes Blender when you use AO Bounces in certain scenes, not in simple or empty scenes..
Juan Gea (juang3d) awarded T54888: Fracture Modifier 2.8 port a Party Time token. Juan Gea (juang3d) added a comment to T54387: 2.8: Code-Quest (Topics we plan to cover). I´m not sure where to put this, so I´ll put in this more generic thread, but please point me to the correct place if there is one. Juan Gea (juang3d) awarded D2406: Cycles: Experiment with cutout object a Orange Medal token. Juan Gea (juang3d) added a comment to D2406: Cycles: Experiment with cutout object. IMHO this should be included in Master, this is an awesome tool, for example to be able to clean up grass from grass patches that are distributed over a space, when you have to remove those parts that are inside the road but they should not, for example, this is great! Juan Gea (juang3d) created T54562: "Share on Blender Cloud" is not working when using EXR as render output. Juan Gea (juang3d) added a comment to D2662: Cycles: Adaptive rendering based on a norm of rendered pixels. Any evolution regarding this? Specially now that the Code Quest started? Juan Gea (juang3d) added a comment to D2388: Cycles: initial work to support motion blur from Alembic caches..
Juan Gea (juang3d) added a comment to rB4945003ffd52: remesh modifier can now remesh particle systems as well. Since this is a voxelization process (I’m assuming that) couldn’t you split the work in bigger boxers, save in memory just the voxels if each zone limit, work each zone with one thread and once it’s completed merge or interpolate those voxels limits? It´ñs working great, I´m prepairing a tutorial related to this. I assume you solved the motion blur problem yesterday because now I got Motion Blur in Cycles with the latest fracture build! And I just noticed your sample with the surface deform, yes, it could be similar to surface deform, but using particles instead of meshes and with the abiltiy to break those meshes based in distance from underlying particles or something similar. On a side note, maybe this motion blur thing can be also applied to the actual Fracture Modifier results, since if we don´t bake the results to keyframed objects we don´t have motion blur, but this removes the ability to have a non broken object using the Perform Merge option, wich is super useful with glass. Yes, think about a grid of particles, with the Molecular Addon you have the ability to make that group of particles to behave as a solid object, and using forces and collisions you can make that group to split or break, it is similar to the old days when Sotimage made use of Lagoa Unified simulation system. But then... how does elbeem fluids do the motion blur with Cycles? Juan Gea (juang3d) awarded rB4945003ffd52: remesh modifier can now remesh particle systems as well a Like token. No motion blur in particle systems remeshed. Exactly, this is very useful to be able to use fluids in production via Alembic. Juan Gea (juang3d) awarded D2970: Viewport HMD integration using OpenVR a Like token. So... how is this going? Is some alternative to this already implemented in Master, since we can take multiple geometry samples I though something could be already implemented, just asking. Juan Gea (juang3d) added a comment to rBfa3d50af95fd: Cycles: Improve denoising speed on GPUs with small tile sizes. Why not make the denoise as a post-render pass as other render engines? This would kill the small-tiles problem because the denoise could be done with bigger tiles, I never understood why the current implementation does the denoising at the same time of the rendering. Juan Gea (juang3d) added a comment to D2873: Cycles: Allow rendering with GPUs an CPUs at once. If the tile is too big it can happen that the GPU finishes early and then has to wait on CPU threads to finish their tiles. Juan Gea (juang3d) added a comment to T52754: Animated textures (like MP4) are not refreshing during playback or frame changing. I promise I won't change the status of the task again if you say this is not valid and it has some correct workflow, but I was not sure if you were receiving the updates since it was tagged as invalid, so I re-enabled it. Juan Gea (juang3d) reopened T52754: Animated textures (like MP4) are not refreshing during playback or frame changing as "Open". Juan Gea (juang3d) created T52754: Animated textures (like MP4) are not refreshing during playback or frame changing. Juan Gea (juang3d) closed T52700: No Splash Screen option in the help menu as Resolved. Juan Gea (juang3d) created T52700: No Splash Screen option in the help menu. Juan Gea (juang3d) added a comment to D1788: Cycles: Experiment with shadow catcher. Nooo! Do not share screenshots, share .blend file instead! That is the only way for developers to troubleshoot. This applies to @Sean Kennedy (hype) and @David Andrade (davidandrade). @David Andrade (davidandrade), when you mention GPU, is it CUDA or OpenCL? OpenCL is currently missing implementation, so i'm not sure what funky results will be happening there. In this scene, it's just an environment light (HDRI). Seems to be working as expected. 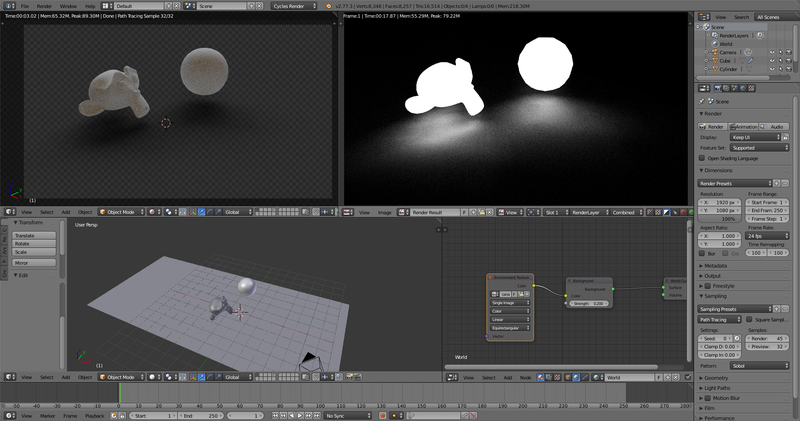 In this next one, I added a point light and a mesh light (plane). Still seems to be working ok.
Is the idea to someday have it as an actual shader? That might give a bit more control, especially in the viewport. Anyway, nice work so far! Keep it up! Juan Gea (juang3d) added a comment to T48075: Alembic Basic IO. Ok, then if someone can guide me to build alembic and link it I can prepare a VM and make a build, I'm not sure how to do those two things, for the time being I know how to build blender and how to apply a patch, but I don't know what do I have to build regarding alembic and how the linking works. Juan Gea (juang3d) awarded T48075: Alembic Basic IO a Like token. Ok, I did some fast tests, I'll prepare some pictures tomorrow but so far the problem I see is that if I use a geometry light (wich is what we use nowadays) the shadow catcher does not catch any shadows, so I.E. 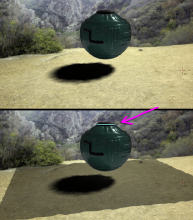 if you put a box over a plane, activate the plane's shadow catcher option and put an sphere as light source, even deactivating the environment completely, there is no shadow at all, but if you see the plano without the shadow catcher option, you can see the shadow created by the sphere. I'm prepairing a 2.77 build to test this, but so far from the description I just miss the ability to reflect things, so the shadow catcher should have the hability to create reflections apart from catching shadows, so for example if we have to place an object in a shiny surface we get the shadows + the reflections. Juan Gea (juang3d) awarded D1788: Cycles: Experiment with shadow catcher a Love token. Juan Gea (juang3d) updated subscribers of D1783: Alembic Import/Export. Sorry Julian, you are right. Juan Gea (juang3d) added a comment to T40092: Blender 2.7 - can't access network paths. Weird but in the build of 2.77 RC2 I have I can't see the network drives, but I just have made a custom build with the latest code of the git repo and I can see the network drives like X: so it seems to be fixed now, at least for me. Same situation here, the thing is that I have the drive mapped to X, it's a local hard drive folder that I map to a network drive to have a uniform work drive. Juan Gea (juang3d) added a comment to D1783: Alembic Import/Export. Is there a way to compile this as an addon that does not require a complete Blender compile? Using it in production right now... just because I can. Wouldn't have happened without that patch. I just managed to build it on Fedora 22 and took a quick look. Works exactly how I would want it to work! Thanks for sharing this awesome patch DwarfLabs!!! May I ask someone to post a build with this somewhere? (for Windows 64 I mean) I can't build Blender in my system right now but I would like to test this and see how it compares with our current Alembic workflow with other packages. Juan Gea (juang3d) awarded D1783: Alembic Import/Export a Yellow Medal token.